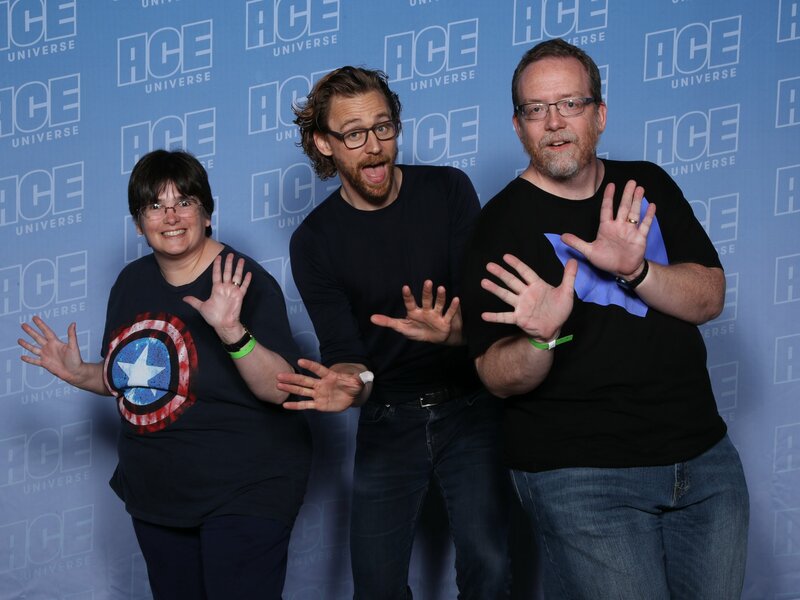 jazz hands « Midlife Crisis Crossover! C2E2 2019 Photos #2: David Tennant! The Tenth Doctor is very, very in. 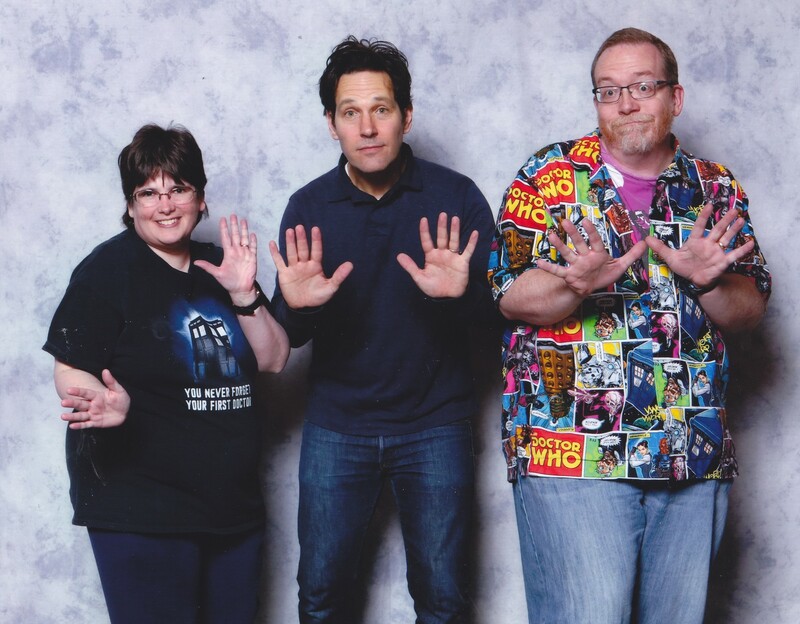 …and often pose for jazz-hands photos as a team. 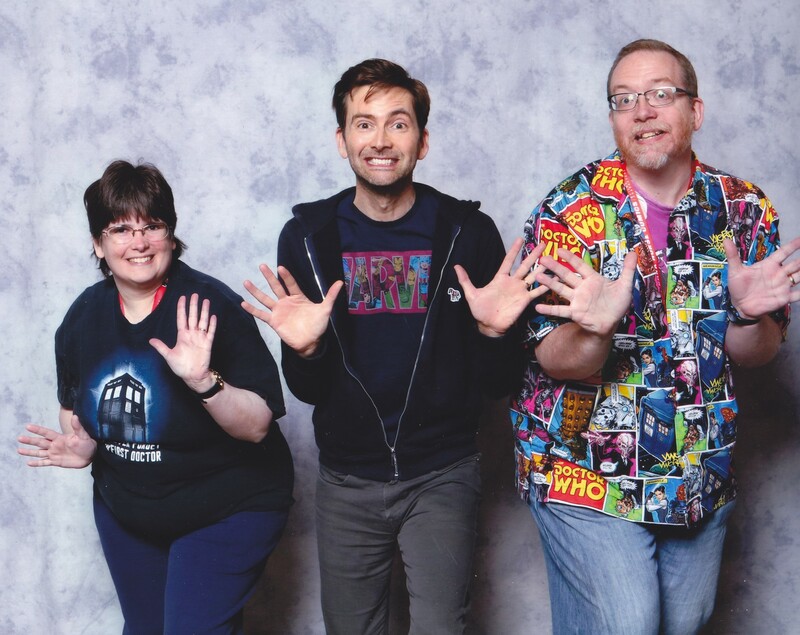 To wit: our special moment with David Tennant. You might remember him from such shows as Doctor Who, Jessica Jones, Broadchurch, and more. Technically this moment should’ve happened sooner — Tennant was originally scheduled as a guest at Wizard World Chicago 2017 but had to cancel on the day-of for understandable, serious reasons. Frankly, I was worried he’d have to cancel again, but he thankfully didn’t encounter the same work-visa issues that have hindered the plans of other would-be convention guests from overseas over the past few weeks. For us, this photo therefore represents relief, fandom fulfilled, and extremely delayed gratification. 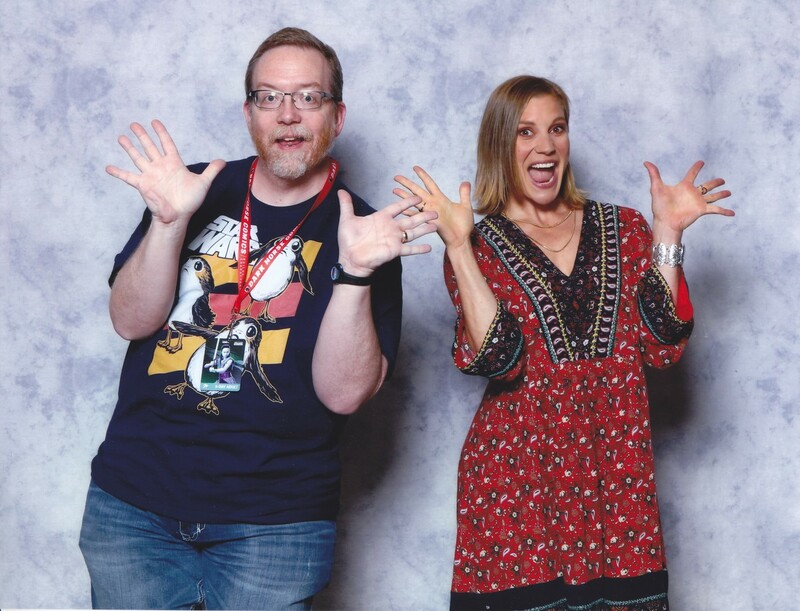 C2E2 2018 Photos, Part 1: Another Jazz Hands Gallery! 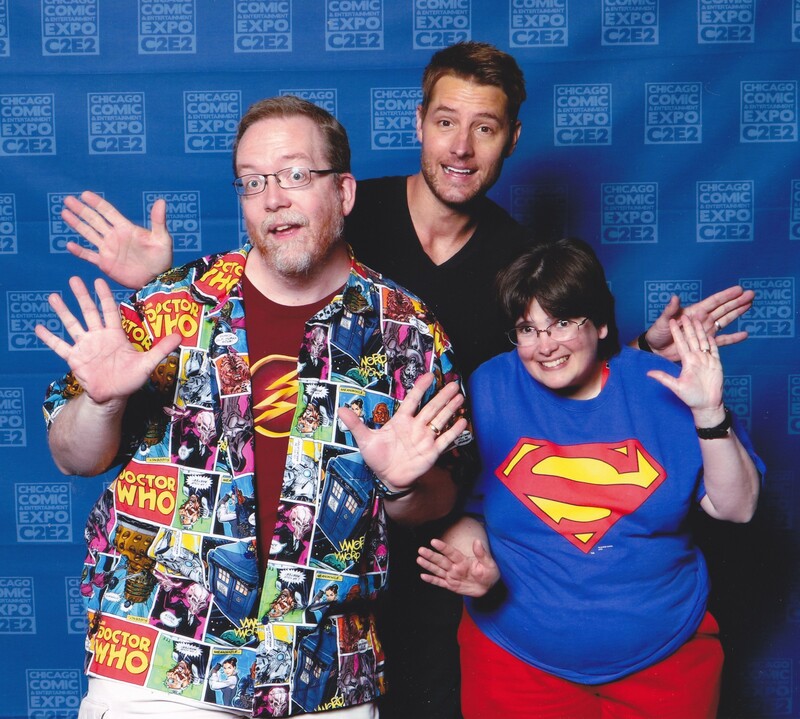 You may know Justin Hartley from NBC’s top-rated drama This Is Us, but Anne and I were fans of his work on Smallville as The CW’s original Green Arrow. In this special miniseries I’ll be sharing memories and photos from our own C2E2 experience and its plethora of pizzazz. Normally we lead off every convention miniseries with cosplay photos, but we’re rushing this batch of photos to the front of the line because several of my coworkers have vested interests in a few of the personalities we met this year. Hopefully this all-star talent lineup brightens their Monday morning. 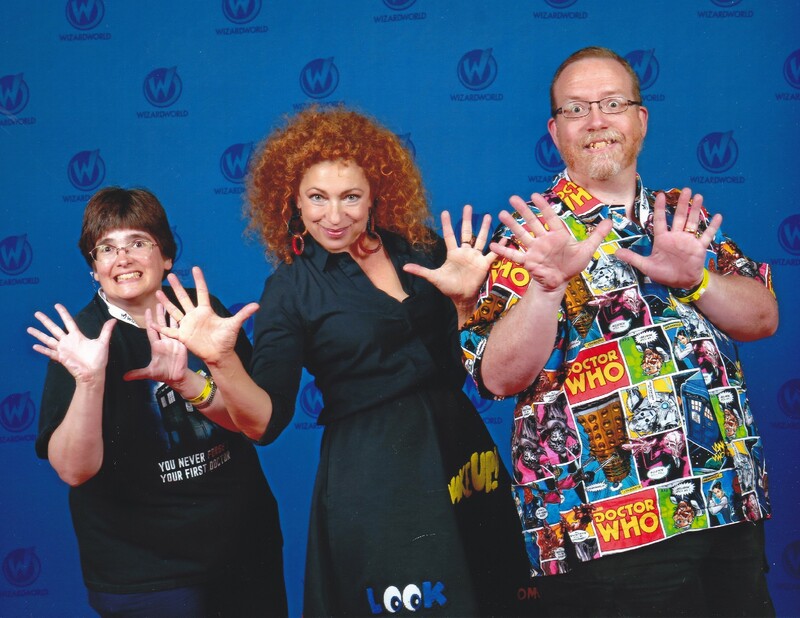 My personal fave from this year: at WIzard World Chicago, Alex Kingston, whom I first saw on NBC’s ER. Much later she returned as Doctor Who‘s Professor River Song. She was one among three of the Doctor’s companions we met in 2017. Here in the doldrums of January, when not much is going on outside our humble abode, my wife Anne and I have already tentatively mapped out our 2017 convention plans, with room for additions if any wild opportunities come up in the months ahead. As an antidote to the soggy winter blues and the current political climate that has all but murdered my enjoyment of most of the internet lately, we’d like to take a look back at the actors we’ve met over the past three years with this very special photo compilation of one of our favorite convention activities: asking actors if they’ll join us in a bit of jazz hands. That previous gallery collected our jazz-hands experiences from 2014 to 2016. Our 2017 has come and gone and, as previously reported, we broke our personal record for most events attended in a single year, which added up to a veritable chorus line full of what Broadway pros call “Fosse fingers”. We won’t come anywhere close to topping ourselves in 2018 or for the foreseeable future, so please enjoy the following clipfest starring a plethora of talented folks who have impressed us in movies or on TV who were willing to play along, including one accredited pro who was actually there on the front lines at the dawn of the jazz-hands era.